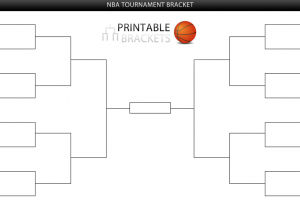 The NBA tournament bracket is one of the highlights of the sporting year in the United States. Each year, the 16 teams with the best record compiled over the course of an 82-game regular season compete against each other in a tournament to determine the NBA’s champion. The NBA tournament is a 16-team bracket comprised of the teams that won the most games through the course of the season. Teams are separated into two sections based on which conference they play in. They are seeded from #1 to #8, with the number-one team being the team with the most victories. The top team plays the lowest seeded team, the second seeded team faces the seventh seeded team, etc. The first round of the NBA tournament bracket sees the teams play each other in a best-of-seven series; in other words, the first team to win four games wins the series. The first two games are played on the home court of the team with the better regular season record. The third and fourth games are played at the home court of the team with the inferior record. All playoff series employ the best-of-seven format. There are plenty of times the team with the superior record is upset; these are the moments, known in the sports world as “Cinderella stories”, that often fuel fans’ interest in the multitude of games that take place and often play out over a course of nearly two months. The NBA tournament bracket is the highlight, the culmination, of the entire NBA season.